A hilarious collection of stories from the life of "The New York Times" bestselling author of "Look Again"
At last, together in one collection, are Lisa Scottoline's wildly popular "Philadelphia Inquirer "columns. In her column, Lisa lets her hair down, roots and all, to show the humorous side of life from a woman's perspective. The Sunday column debuted in 2007 and on the day it started, Lisa wrote, "I write novels, so I usually have 100,000 words to tell a story. In a column there's only 700 words. I can barely say hello in 700 words. I'm Italian." The column gained momentum and popularity. Word of mouth spread, and readers demanded a collection. 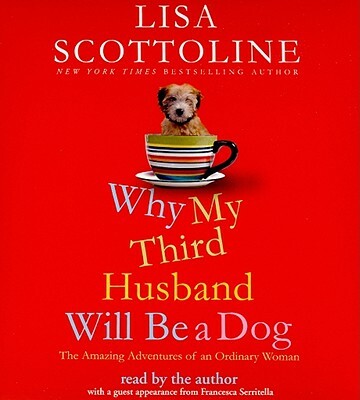 "Why My Third Husband Will Be a Dog "is that collection. Seventy vignettes. Vintage Scottoline. LISA SCOTTOLINE is the "New York Times "bestselling and Edgar Award-winning author of sixteen novels. There are 25 million copies of her books in print in the United States, and she has been published in twenty-five countries. A single mom, she has been named a "Fun, Fearless Female" by "Cosmopolitan "magazine. She lives in Pennsylvania with her daughter Francesca and an array of disobedient pets.